Sun and blue sky! Woohoo! We went for the Western breakfast again. I stuffed myself silly, which would turn out to be a big mistake. After breakfast, we went to meet the tour group. There are seven besides us: George and Mickey from Nashville, TN; Ed and Ed (grandfather and grandson) from somewhere on the East Coast, I think; and Crandall, Brenda, and Brandon, a family from the Milwaukee area. Plus our guide, one Curtis Chen. The first stop was Tien'anmen Square, which was much nicer by sunlight. We had a few minutes to wander around and look at the sights, but since Kat and I had done that two days before, I concentrated on taking pictures of things I hadn't gotten before, or that looked better with actual direct sun on them. I have hopes that I got a good picture of the National Flag with the Gate of Heavenly Peace as a backdrop. 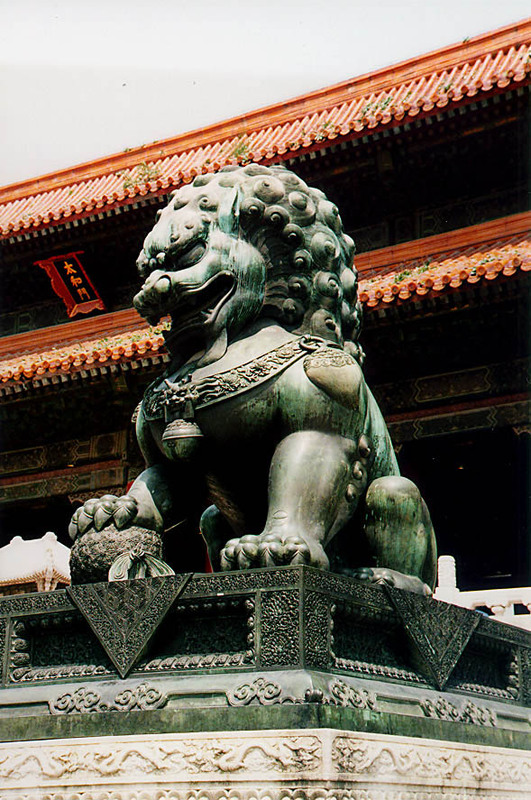 We proceeded into the Forbidden City, and almost immediately lost Brenda, the mother in the Milwaukee bunch. This was in one of the first courtyards-- we were walking along in a loose group, and when we formed up to enter the first gate, boom, she was gone, just like that. Kat and I both got the impression, based on her family's reactions, that this was not unusual for her. Since the rest of her family didn't seem deeply worried, and we were on a schedule in any case, we forged ahead. I wasn't as impressed as I thought I would be. 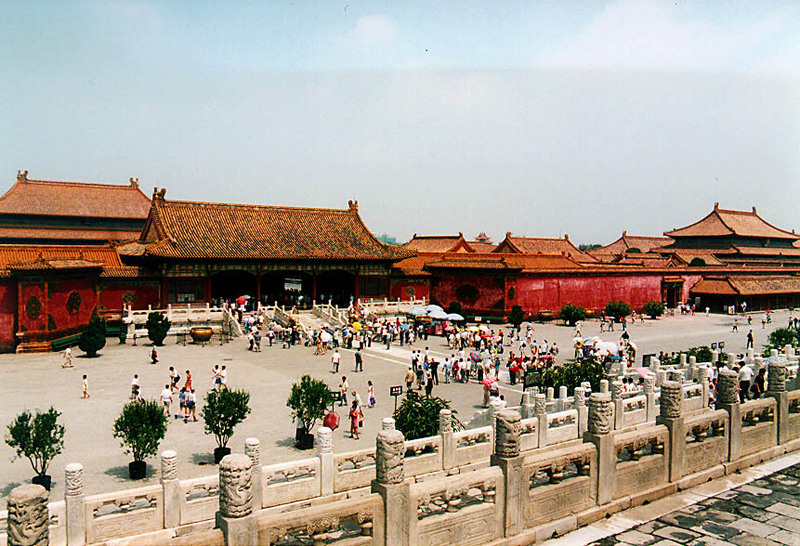 The City is certainly large, but the bulk of its area is large open courtyards, with no trees, benches, or much of anything else between the buildings. Granted, the architecture and decoration is quite beautiful, but even with throngs of tourists, I was struck by a feeling of emptiness and almost desolation. The only exception to this was the gardens at the north end of the city, which were lovely (if crowded). Brenda failed to appear at the North Gate, so we headed off to lunch at the International Hotel, which has one of those rotating rooftop restaurants. Lunch was a buffet setup, and the only thing I clearly recall was Kat choking on the Korean pickle soup, which proved to be too spicy, even for her. I didn't eat much, since I'd eaten so much at breakfast, and there wasn't much which interested me on the buffet. While at lunch, I threw caution to the wind and ordered a glass of ice water, which means that if I can't stomach local water then I'm going to be sick. We were also vastly amused to see a sign in the hotel lobby reading "Welcome Yale Alumni Chorus." The afternoon was spent at the Summer Palace, which is more like a private resort for royalty than an actual palace. The main feature is an enormous lake which was literally dug out by "volunteers," as they said. It was astonishing to think that there had once been a plain there, and a million or so laborers had simply dug a lake there (and created an adjoining small mountain in the process, atop which stood a Buddhist shrine). 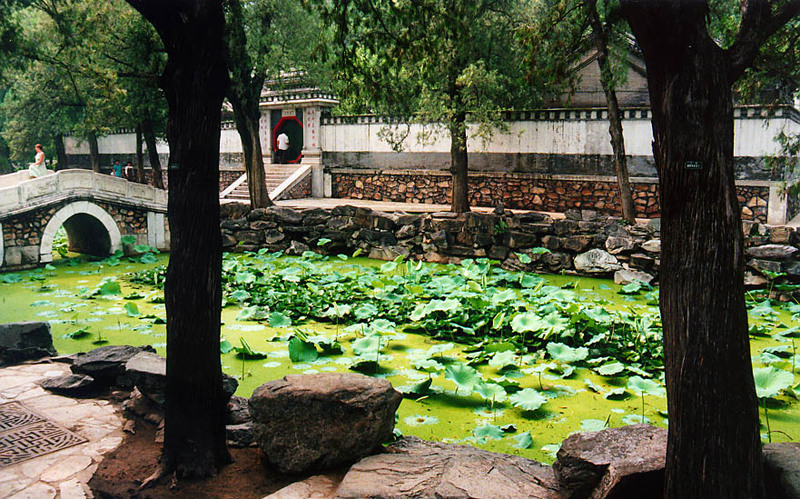 The lake has an island which is connected to the mainland by a bridge, and a very long peninsula, the top of which seemed to be a prayer garden or other shrine. There were a great many gardens, only a few of which we were able to see, and the longest illustrated corridor in the world. This corridor is open on the sides, probably to catch the breeze (which it did very well), and all its beams and surfaces were painted very colorfully. The base color seemed to be blue, perhaps to match the lake. Kat and I climbed the steps up to the hilltop shrine where the Empress Cixi would pray once a year. The view was spectacular, even through the humidity haze, which had returned by mid-day. Beijing in the distance, plus the palace lake below us, was quite an impressive sight. The buddha-- which was much like a shiva, oddly enough-- was suitably large, and many people were making offerings and praying. Kat, meanwhile, got her name enscrolled by a calligraphic artist. Lots of people seemed quite fascinated by her scroll, possibly because they don't see English characters all that often. The children especially seemed entranced-- or maybe amused. 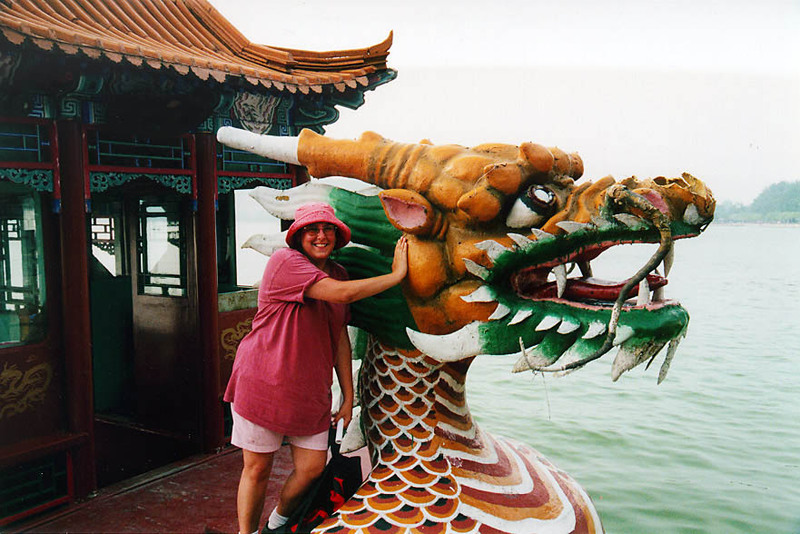 Upon our descent, we (as a group) took a dragon boat across the lake, and then went back to the hotel. I was doing rather poorly, having developed a headache, so as soon as we made it to our room, I took a cool shower, swallowed a super-Tylenol, and got into bed. Kat, on the other hand, was pretty wired, so she set out "to find the real China," as she put it. So while I slept, she actually found it! I'll let her tell about it in her own words, since I wasn't there. After a day of touristing, we drove back to the hotel by the back way, passing on the way several small streets that were packed with stalls selling things. After putting Eric to bed, I set out to find these streets. Making my way back I soon found myself in small alleys, walking in what I thought was the right direction, and I found it. The streets were lined with stalls and part of the street was a farmer's market, complete with live animals. The children stared at me and using my very limited Chinese I talked to them. They taught me to count on my fingers. The street food looked and smelled wonderful but I resisted. I bought instead a set of three happy Buddhas and a large set of tiny teapots with animal-figure lids. When Kat got back, she ordered up some honey BBQ pork, rice with chicken and salted fish, and salted nuts, and even served some to me until I perked up enough to feed myself. Clearly I do not deserve someone this kind and giving, but hey, I'll take it. Anyway, since I was suddenly ravenous, Kat's diagnosis was dehydration and salt loss from all the sweating I'd done that day. Mild sunstroke, in other words, probably complicated by my not eating very much for lunch. Good one, Eric. We both fell asleep quickly-- slept very well.